Dr. Greg McLeod took office as president of Edgecombe Community College in August 2018. He is the fifth president of the College, which was founded in 1967. A native of North Carolina, Dr. McLeod grew up in the small town of Raeford near Fayetteville and Lumberton. After graduating from the North Carolina School of Science and Mathematics in 1989, he earned a bachelor’s degree in math education at UNC-Chapel Hill as an NC Teaching Fellow Scholar. After college, he taught middle school and high school math before working briefly in corporate marketing. Later, he earned a master’s degree in training and development and a certificate in business management at NC State University and a Ph.D. in leadership and education at Barry University in Florida. Dr. McLeod began his community college career at Durham Technical Community College teaching developmental math, first as an adjunct instructor and then as a full-time instructor. From there, he served in a variety of roles at St. Petersburg College in Florida, supporting student retention and success initiatives, overseeing college-wide testing and student system support, and eventually leading student affairs of the Health Education Campus. Next, he served as provost and executive director at St. Johns River State College, leading campus operations, academic and student affairs, and community relations for the St. Augustine Campus. 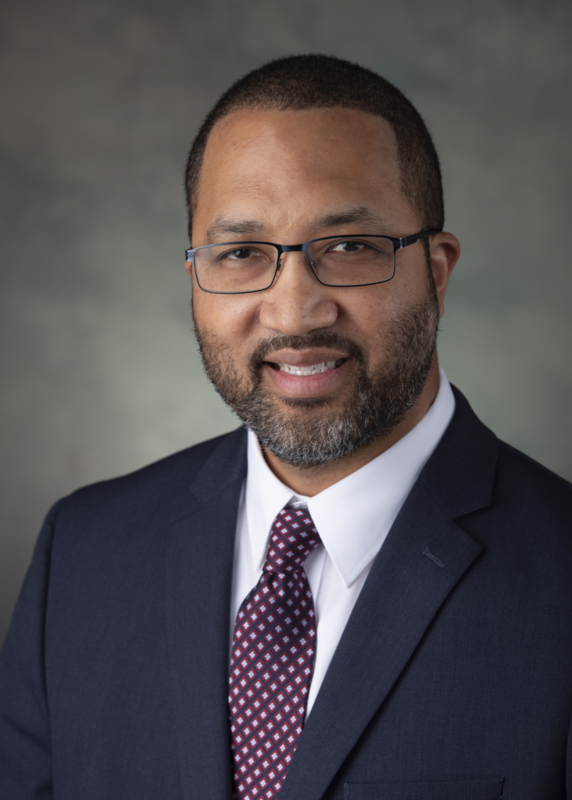 Following this role, he served as provost and chief administrative officer of the Williamsburg Campus at Thomas Nelson Community College and as the college-wide interim dean of health professions. Dr. McLeod is a member of the American Association of Community College’s Commission on Student Success and has been active in several higher education-related groups over the years. His dissertation research focused on selected predictors of academic success for students in developmental math, and he has presented at numerous conferences on student retention and success. He strongly believes in mentoring and serving the community. He has actively served as a mentor to middle school, high school, and college students over the years and developed and led a summer technology camp targeting underserved youth. He also helped to coordinate and lead high school leadership and youth career exploration programs. Dr. McLeod is a member of the NC Association of Community College Presidents, the American Association of Community College’s Commission on Student Success, and the American Association of Community College’s National Council on Black American Affairs. Locally, he is a member of the Tarboro-Edgecombe Chamber of Commerce Board of Directors, Upper Coastal Plain Learning Council, Strategic Twin-Counties Education Partnership Board of Directors, Rotary Club of Tarboro, and Carolinas Gateway Partnership. Dr. McLeod is a member of Kappa Alpha Psi Fraternity, Inc. and Sigma Pi Phi (The Boulé) Fraternity, Inc. He is married to the former Beverly Wilkins of Oxford, NC, and together they have a 15-year-old son, Jordan; a 13-year-old daughter, Kyla, and a Norfolk terrier/shih tzu dog named Bonnie.